“Hamlet without the Prince of Denmark” is perhaps an apt description of how the International Workers Day was observed in Sri Lanka on May 1st. Instead of being given pride of place on May Day, the workers and their trade union leaders were virtually ignored by the political parties conducting rallies and processions on workers day. The May day event has been transfigured or disfigured into a Political Tamasha by major political parties. The pathetically fractured trade union movement and hopelessly debilitated working classes of Sri Lanka have either been unable or unwilling to check or counter this increasing politicisation and consequent diminution of the trade union sphere over the years. The transformation of May day into a political event where the workers were treated as children of a lesser god is only symptomatic of a malady that has afflicted this country for many decades. The sea of red that this writer witnessed on May day during his childhood slowly began changing colour to seas of green and blue over the years. With the presence of artistes and actors from India on stage, the meaning of May day got distorted as a cultural show. The entry of trade unionists into politics and politicians into Trade unionism was a slow ,creeping process that resulted in the gradual weakening of the working class movement. Trade union influence was shamelessly used to enhance political power.Inter – party and intra-party differences impacted on trade unions and fractured the trade union movement. Trade union activity was used to build a political base. Trade union agitation was used as a pressure tactic to gain political clout. This negative trend climaxed with the monumental tragedy of Leftist leaders in their new cabinet minister avatars ruthlessly crushing the trade union movement on which they climbed to power. It is against this dismal backdrop of a deteriorating trade union movement, that this column focuses on a man who was perhaps the last of the great trade unionists. A legend in his lifetime who was at the helm of a vibrant trade union continuously for a period of sixty six years – an unsurpassed record! A trade union leader about whom I have written earlier in these columns – who is no more with us having passed away last September – and whose 93rd birthday falls next week on May 23rd.I am of course referring to Comrade Bala Tampoe who was the Ceylon Mercantile Union(CMU) General-secretary from 1948 to 2014.Though called the CMU still, the amended name of the union is now The Ceylon Mercantile, Industrial and General Workers Union. Being General Secretary of the CMU for 66 years since 1948 has been a marvellous achievement . All the more so because of comrade Bala’s ethnicity in Sri Lanka’s deeply divided society.Philips Balendra Tampoe was of Jaffna Tamil origin.The membership of the CMU though multi-ethnic is predominantly Sinhala.This fact has been highlighted often by many observers of Sri Lanka’s political scene.It is however noteworthy that Bala had never ever projected himself as an Ethnic Tamil or engaged in communal politics. 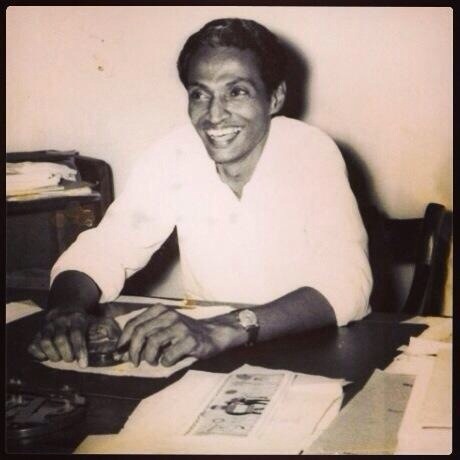 Bala was born in Negombo on May 23rd 1922. Both his parents were of Jaffna Tamil stock.His father Francis Tampoe-Philips was an excise officer under British rule who served in various parts of what was then known as the Madras presidency in India. The Madras presidency consisted of most districts of present day Tamil Nadu , several regions of present day Andhra Pradesh and parts of present day Kerala, Karnataka and Orissa states in India. Bala’s mother was Beatrice Thangamma Saverimuttu. Though hailing from Jaffna she was born in Kurunegala.Her father was Mudaliyar A.G.Saverimuttu who had been chief post master at the General post office in Colombo for many years. The rank of Mudaliyar had been conferred on him by the British rulers in recognition of his distinguished service to the crown. Bala was born and baptised as a Christian.His given name then was Balendra Tampoe-Philips. Due to compelling circumstances during school days, his mother registered his name as Philips Balendra Tampoe when admitting him to Royal College in 1934. Ten years later after graduating Bala was appointed as lecturer in Botany and Horticulture at the Peradeniya School of Agriculture in February 1944. It was then that he legally changed his name to Phiips Balendra Tampoe and placed advertisements to that effect in newspapers. He became known thereafter in a general sense as Bala(derived from Balendra) Tampoe or PB Tampoe. “The first paternal ancestor to convert to Christianity from Hinduism was my great grandfather. He took the name Mathew Philips.He might have been given his Christian name as well as his surname by the Christian missionary – who was probably an American – who baptised him .Mathew Philips was born in 1817 and died in 1852. He was a Tamil Pundit and Teacher. He was also the Head Catechist and General Agent in the American Mission church of that time”. “My paternal grandfather was John Francis Philips, who owned a coconut estate in Pallai in the Jaffna peninsula where my father was born.My grandfather also raised herds of cattle in Pallai. (Cattle and Coconuts-C and C ,Bala chuckled).He married the daughter of Thamotherampillai Mcgowan Tampoe the first Ceylonese Magistrate of Jaffna under British rule in this country. She was my grandmother.It may be of interest to note that well known film director Robin Tampoe, was a son of a brother of my father’s mother. My father who was the eldest son in the family adopted the surname Tampoe-Philips by adding his mother’s maiden name to his father’s.That is how my original name got to be Balendra Tampoe-Philips”. “My father Francis Tampoe-Philips worked in different areas of the Madras presidency. I was the third of six siblings, with two elder sisters, a younger sister and two younger brothers, all of whom, but for me, had been born in various towns in the Madras Presidency. I happened to have been born, on 23rd May 1922, in Negombo, because my mother had gone there to stay with a younger sister of hers, when she was expecting a child, who turned out to be me”. “My eldest sister Zena died of double pneumonia, at a little over eight years of age, in Bangalore, in August 1927. Shortly afterwards, my younger brother Narendra, a year younger than me, died of diptheria. Soon afterwards my baby brother who was nine month’s old also died of the same ailment. I was left with two sisters, Irma, a year older, and Cynthia Jayatri, three years younger than me. The three of us were taught at home by our mother, as we could not gain entrance to schools in Bangalore straight away, when my mother decided to stay there with us instead of accompanying my father to various stations in the Madras Presidency”. “My mother sent an application for my admission to a leading Anglican boy’s school, Bishop Cotten’s College, in Bangalore .The application was accepted and my mother was notified that her son was admitted under the name B.T.Philips. In those days there were ethnic quotas in school admissions in India and students were classified accordingly. The school officials had mistakenly categorised the name BT Philips as an English or Anglo –Indian student. We did not know this”. “ It was when I went to Bishop Cotten’s, in 1930, on the date of admission, with my mother, that the school authorities discovered that I was neither English nor Anglo- Indian.The British Headmaster informed her, to our utter dismay, that I could not be admitted, as I was neither the one nor the other! The quota for admission at that time was four English or Anglo-Indian students, to one Indian. That quota had already been filled, we were told.So I was deprived of admission to that prestigious institution”. “A kindly English lady who had befriended my mother gave us a children pre-school education, and then later on she got us admitted to Clarence School in Bangalore, in 1931. It was run by the Seventh Day Adventist Mission, to which she belonged”. This then was the story of how Bala Tampoe’s father Francis Philips became Francis Tampoe-Philips and how the son Balendra Tampoe –Philips turned into Philips Balendra Tampoe. Bala Tampoe was a colourful personality of multiple dimensions. Underground member of the Lanka Sama Samaaja Party(LSSP)during Second world war days;agricultural dept lecturer who lost his job due to involvement in a general strike; leader of the same trade union for more than six decades; fiery orator known for defiant speeches;last living witness of the independence ceremony of Ceylon when the union jack was replaced; key organizer of the historic 1953 “Hartal”;one time Central committee and Politibureau member of the largest Trotskyite party recognized by the fourth international;architect of many strikes including one which paralysed the Colombo harbour causing declaration of emergency ;one of the trouble-making leftists earmarked for incarceration at the Naval armoury by the 1962 coup d’etat planners;pioneer of collective agreement that proved to be a model for many such agreements;trade union leader who ushered in the payment of allowance scheme based on the rise in the cost of living index;man behind a series of strikes leading to progressive measures regarding termination of employment;co-leader of revolutionary breakaway group in LSSP that formed its own party;unsuccessful candidate in three parliamentary polls;lawyer who defended JVP comrades free of charge after the 1971 insurgency;dedicated trade unionist who drove to office and back for six days of work even at the age of 92.These are but a few facets of comrade Bala Tampoe. Bala Tampoe’s foray into Parliamentary politics was not very successful.The CMU’s flirtation with electoral politics was also a failure. Bala Tampoe first contested Parliamentary elections in 1960. He was fielded by the Lanka Sama Samaja Party LSSP) under the key symbol in the multi –member constituency of Colombo Central returning three MP’s.March 1960 polls were held at a time when the LSSP was expected to romp home as winners and Dr. NM Perera become Prime minister.Bala was expected to come first in Colombo Central.Yet it was Dr.MCM Kaleel and Ranasinghe Premadasa of the UNP along with the Communist party’s Pieter Keuneman who won. Bala Tampoe came fourth out of fifteen candidates polling 22,228 votes. In the July 1960 elections the number of candidates had dwindled to six. For some reason the expectation again was that Bala Tampoe would be elected as first MP. But again that was not to be. Sir Razeek Fareed from the SLFP came first with Pieter Keuneman and Dr. Kaleel coming second and third respectively. Bala Tampoe came fifth behind Ranasinghr Premadasa. His vote tally had shrunk to 16,406. The LSSP underwent a crisis when the party leadership opted to form a coalition govt with the SLFP led by Prime minister Sirima Bandaranaike.14 members of the then LSSP central committee dissented. These included Bulathsinhala MP Edmund Samarakkody, Moratuwa MP Meryl Fernando, Theoretician V.Karalasingham and Bala Tampoe. The dissident group formed the LSSP-R or LSSP-Revolutionary party minus the Karlo group of Karalasingham that rejoined the parent body. The mainstream LSSP was expelled from the fourth international and the LSSP-R was recognized in its place as the Ceylon section of the fourth international. The LSSP-R contested the 1965 parliamentary elections but did not fare well. Bala Tampoe contested in Colombo Central again but this time under the lamp and not key symbol. He came fifth out of ten candidates polling only 4,559 votes. The LSSP-R underwent further fragmentation when Edmund Samarakkody left the LSSP –R after engaging in a vitriolic campaign against Bala Tampoe. The Edmund faction formed the Revolutionary Samasamajist Party. Later on it became the Revolutionary Workers party. The LSSP-R continued to be under the sway of Bala Tampoe. The CMU was its mainstay.The LSSP-R did not contest the 1970 General elections and accused the LSSP and Communist party of “misleading the masses”.The party too was renamed as the Revolutionary Marxist Party (RMP) and continued to be recognized as the Ceylon/Sri Lanka affiliate of the United Secretariat of the fourth international for several years. In 1977, Bala Tampoe reversed the earlier position of not contesting parliamentary polls and fielded a few candidates at the July hustings. Bala Tampoe himself did not contest. The CMU and RMP together put forward four candidates on a “revolutionary socialist platform” calling for “the overthrow of capitalist rule and the establishment of a Workers’ and Peasants’ Government by the masses”. Upali Cooray and TN Perera contested on behalf of the RMP in Dehiwela and Kesbewa while Vernon Wijesinghe and HA Seneviratne were put forward by the CMU in Colombo north and Kelaniya. All four fought the election campaign under the bell symbol. The results were a disaster. The four candidates got 402, 298, 193 and 162 in Dehiwela, Kesbewa, Colombo North and Kelaniya respectively. The failure of the Parliamentary path and the personal electoral defeats of Bala Tampoe in 1960 and 1965 were blessings in disguise for trade unionism in general and the CMU in particular. Bala Tampoe organized a series of more than 70 strikes across the country protesting the way employers could summarily dismiss workers,.This led to the then Prime minister Dudley Senanayake meeting with him to discuss ways and means of addressing the issue. Bala Tampoe proposed that the State should step in and examine grounds for removal. Tampoe submitted a legal draft which laid the foundation for the Termination of Employment Act that was enacted in 1971. The larger than life image of Bala Tampoe in my perspective kept growing as I too grew up. Many relatives and friends in the private sector were CMU members and the stories they told about Tampoe enhanced his image further in my eyes. The Janatha Vimukthi Peramuna(JVP) led insurgency of 1971 captured the imagination of youths in the seventies. Bala Tampoe aided by a team of dedicated lawyers appeared for many of the accused at the Criminal Justice Commission. Even as I lapped up newspaper reports of the proceedings eagerly, my esteem for Bala Tampoe too increased. I began interacting with him as a journalist when I worked at “The Island”.When I first joined the newspaper in November 1981 I used to cover the Trade Union and Customs as my regular beat. However I was soon put on the Tamil political round at “The Island”.With the ethnic crisis escalating the “Tamil round” assumed crucial importance.I found myself writing many news stories and articles and even a weekly column pertaining to the ethnic problem. The trade union beat was taken off. My interaction with Bala Tampoe ceased.In 1988 I left the shores of Sri Lanka. Meanwhile Bala Tampoe reached the ninety year milepost in 2012. I went to the CMU headquarters in Kollupitiya one morning after a friend had secured an appointment to meet Bala Tampoe. The CMU office that buzzed vibrantly with activity at one time seemed relatively quiet now.It seemed to have lost its lustre just like trade unionism in the country.When I walked into the hall and saw Bala from afar, the nonagenarian seemed to look the same despite the withering gaze of age.When I got closer I could see the toll of nine decades.Yet he was quite sprightly in his walk and had a firm handshake as usual.The physical movements were somewhat slower but unimpaired. His hair remained still with a silvery grey hue. When I sat down to converse I discovered that the fire in the doughty fighter for workers rights was still blazing away.He was in full command of his faculties. His mind was razor sharp as usual.The flow of ideas and words gushed forth as in the past. The familiar gritting of teeth occurred frequently.The fiery glint in his eyes was very visible at close quarters.His memory was fantastic. “Bala Tampoe lives in Ratmalana. The CMU office is in Kollupitiya. Each day he drives from home to work and work to home. Bala drives a vintage Volkswagon that he has been using for decades.He works six days a week and at times seven depending upon necessity. His workday is around 7 to 8 hours daily. “I usually wake to the sounds of early birds chirping outside my bedroom window, between 5.15 and 6 a.m. I then make myself a cup of tea, and sit down to my laptop, to check my e-mail and respond thereto straightaway sometimes, or just browse a bit on the internet, before I prepare my breakfast”. “I normally leave for the CMU headquarters by 8.30 a.m., driving my old Volkswagen. which I have had re-conditioned recently. The Union spends for its maintenance and costs of petrol for my daily travelling to and from the headquarters. I preferred that to the Union’s purchasing a new car for me, as its General Council had wished. One of my reasons for that preference was that I am too advanced in years to need a car for much longer than I’ve driven the one I have”! “My working day now normally ends by 5 p.m., but continues till 8.00 or even 9.00 p.m. on Wednesdays, when the Executive Committee or the Working Committee meet alternatively, from week to week. It takes me about an hour to drive home to Ratmalana”. “I have a short nap in the afternoons at the headquarters; but have found it desirable as age creeps upon me, to have a longer nap when I get home, before warming my dinner (prepared for me at the headquarters) on a microwave oven”. “After dinner, I stretch my legs a bit, walking around the house for about fifteen minutes, before normally settling down to watch a DVD film till 11 p.m. or later, depending on how absorbing it is and how tired I may be at end of the day – and so it ends! Bala Tampoe lives alone. He was married twice and has two children both of whom are in the USA.I asked Bala about his first wife and children about whom very little is known to current colleagues and contemporaries. “My first wife was Nancy Kotalawela from Passara. She was a Montessori teacher who had been trained by Madame Maria Montessori herself in Kodaikanal, India. I married her on 28th October 1950. Our son Dhiresh was born on 1st December 1951; and our daughter Shyama was born on 6th January 1956. We separated in 1957, and were divorced in April 1966. Nancy left for the United States in September 1967, taking our two children with her, and kept them out of touch with me for more than thirty years in the States”. Bala Tampoe’s second wife was May Wickramasuriya who was an institution by herself. They were married on 22nd September 1966. May worked at the CMU for decades and was well-known in Trade union and Trotskyite circles. She had joined the CMU in 1951 and remained an efficient colleague and loyal companion to Bala Tampoe. She became assistant secretary of the CMU in 1956. May was paralysed after suffering a stroke in November 1995.She died a few years later on 15th December 1998.CMU contemporaries speak highly of the fond affection with which Bala cared for her. Bala describes her as his “companion and comrade”. There is a conference room named after May at the CMU office”. Philips Balendra Tampoe now known to all as Bala Tampoe is one whose name is indelibly etched in the Trade union annals of this country.Comrade Bala Tampoe may be no more today but the legendary leader of the oppressed and underprivileged will always be regarded as an incomparable Sri Lankan phenomenon!